The bright and very young star HR 8799, about 130 light-years away from Earth, hosts a planetary system that looks like a scaled-up model of our own Solar System. 3 giant planetary companions have been detected so far, with masses between 7 and 10 times that of Jupiter and being between 20 and 70 times as far from their host star than the Earth is from the Sun; the system also includes two belts of smaller objects, similar to our asteroid and Kuiper belts. This NACO image shows the star and the middle planet (marked). 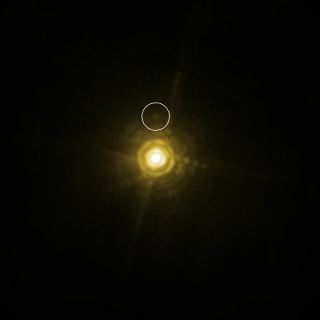 For the first time, astronomers have directly detected thelight signature of a planet orbiting an almost sun-like star. This signaturecan tell scientists the chemical makeup of the planet, which can help themunderstand how it formed. in the future these signatures could be used to lookfor signs of ?life on other planets. The planet is a giant, about 10 times as massive as Jupiter,and it orbits between two other giants around a star similar to our sun in ascaled-up version of ourown solar system. The three giant companions were detected in 2008 and rangein mass from seven to 10 times that of Jupiter, with orbits between 20 and 70times as far from their host star as Earth is from the sun. The system alsofeatures two belts of smaller objects, similar to the asteroid and Kuiper beltsaround our sun. The system's star is about 1.5 times as massive as thesun. Previously, scientists have taken the spectra of stars ? orthe signature of the amount of light they reflect and radiate at differentwavelengths ? by watching an "exoplanetary eclipse" with a spacetelescope. As the exoplanet passes directly behind its host star from the perspectiveof Earth, the light that comes only from the planet can be subtracted out fromthat that comes from the star. But, this method can only be used on the small fraction ofexoplanets that have the right kind of orientation with respect to the Earth. The team of astronomers that observed the giant planet wereable to do so without looking for an eclipse, instead detecting the planet'slight directly with a ground-based telescope: the European SouthernObservatory's Very Large Telescope in Chile. "After more than five hours of exposure time, we wereable to tease out the planet's spectrum from the host star's much brighterlight," said team member Carolina Bergfors. Picking out the planet's light is tricky because the hoststar is several thousand times brighter than the planet. "It's like trying to see what a candle is made of, byobserving it from a distance of two kilometers [1.2 miles] when it's next to ablindingly bright 300 Watt lamp," said team member Markus Janson of theUniversity of Toronto. The light spectrum of the planet can show what theatmosphere of the world is like, though in this case it reveals that theatmosphere is still poorly understood, not matching up to any current models. Eventually, though, scientists hope to be able to moreeasily detect chemical signs of life on other worlds by their signatures inlight spectra. Certain molecules that are important to life or a potential signof it that havebeen found are carbon dioxide, water vapor, silicate minerals and sodium. The team hopes to use the same methods to get the spectra ofthe other two giant planets in the system, to do a comparison between them. "This will surely shed new light on the processes thatlead to the formation of planetary system like our own," Janson said. The team's findings are detailed in the AstrophysicalJournal.